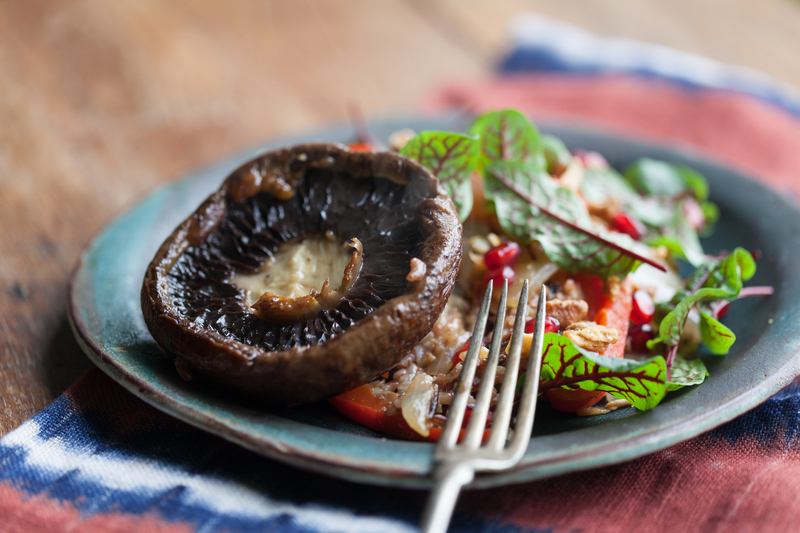 I particularly love roasting Portobello mushrooms, both for their flavor and meatiness. But the combined ingredients: wild rice, sautéed onions and red peppers, pomegranates, red sorrel, add to the overall flavor in the meal. This meal is quite filling that you may not even need to help yourself to a second serving! Add the rice and mushroom broth to a pressure cooker. Bring to pressure and let cook for 25 minutes. While the rice is cooking, prepare a baking sheet with two Portobello caps. Brush the caps with half of the olive oil and a sprinkle of sea salt. Place the caps, gill side down, onto the baking sheet and heat in the oven for 15 minutes at 400°F. Next, add the remaining olive oil to the skillet and begin to sauté the onions over medium heat until they start to caramelize. This may take 5-7 minutes. As they are starting to turn golden brown, add the red peppers and sauté them together for another 2 minutes. Plate the rice first, next add the onion-pepper mixture, and then add the Portobello. Top with pomegranate seeds, crushed walnuts or granola, and the red sorrel.